Under the new ownership of Liberty Media, Formula One is going through a major and much needed digital transformation. A key part of this shift in strategy is placing Fans F1 at the centre of new initiatives in a hope to drive new interest to the sport and increased engagement from the existing fans. In the past few months alone, we’ve seen the launch of Liberty Media’s first ever fan-centric global marketing campaign, the announcement of a new 10-part Netflix F1 docuseries and F1’s biggest digital development in recent years – their over the top (OTT) service, F1 TV. In this post we’ll be using our Audience Intelligence solutions, to analyse the demographics, behaviours and interests of F1 fans to build a better understanding of the suitability of an online streaming service and the impact it will have on future brand partnerships. Costing between $8-$12 USD a month, the premium service will initially be available in Germany, France, USA, Mexico, Belgium, Austria, Hungary and much of Latin America, and on desktop, with mobile apps and TV apps being phased in on Amazon, Apple and Android at a later date. 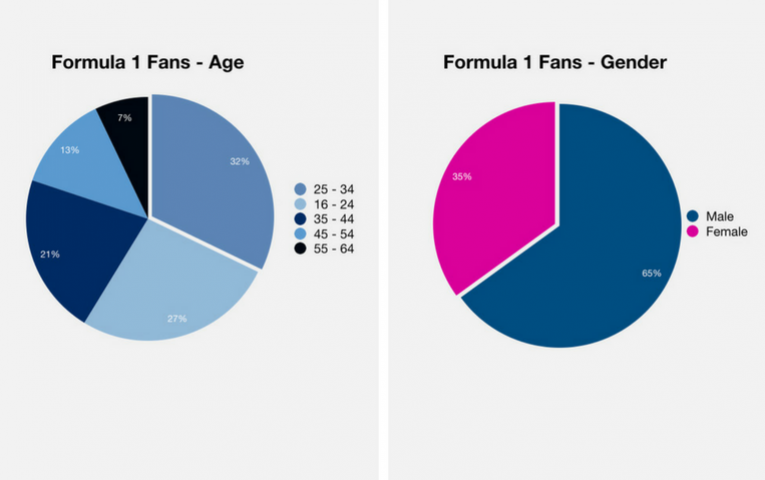 F1 Fans’ Demographic – Who are they? Where are they currently watching F1? Following a shift in the audience’s media consumption behaviours and a significant investment by Liberty Media, it is expected that the share of those tuning in online will continue to increase. As the audience increasingly turns to online services to watch the races, it is a key point that this affluent audience are also 29% more likely than average to purchase a TV streaming service. 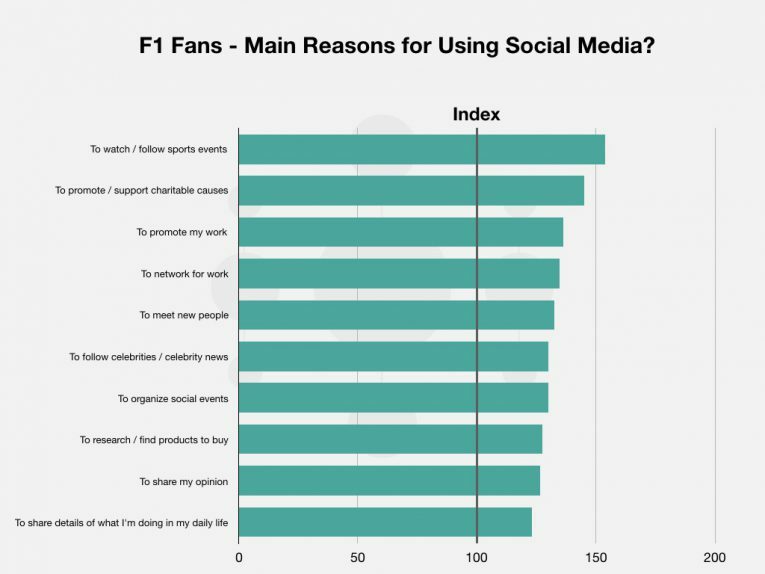 The above indicates how the global F1 audience are far more likely than the typical internet user to use social media to watch a sporting event. Our research also shows the younger the audience, the more likely they are to do so. 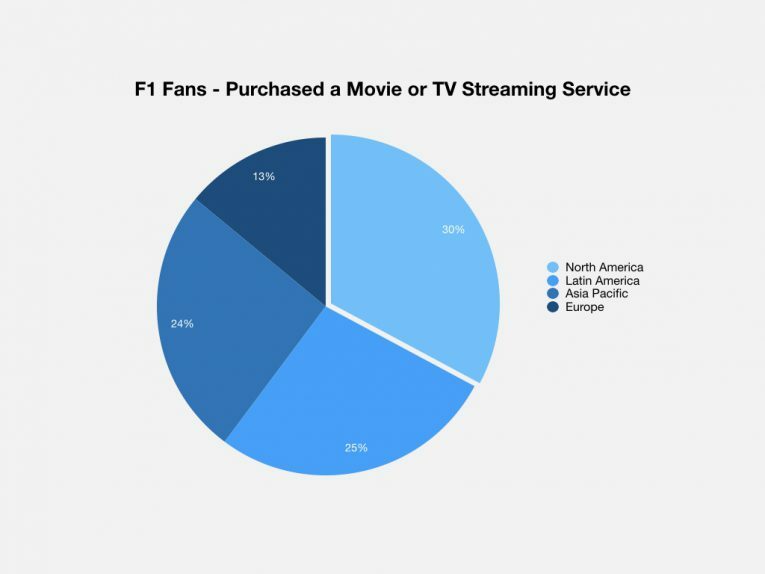 With an increasing number of sport related streaming services being launched, it is clear to see the F1 audience in particular are early adopters in terms of using non-traditional sources to watch and engage with sporting events – whether this be social or sport specific streaming platforms. How Will the New OTT Service Affect Brands? With 15% of Formula One revenue coming from advertising and sponsorship and 32.5% coming from broadcasting (According to Liberty Media Corporation/Formula One) it is vitally important that the new commercial-free streaming service generates income outside of subscription costs, and yet still remains attractive to both brands and fans, alike. 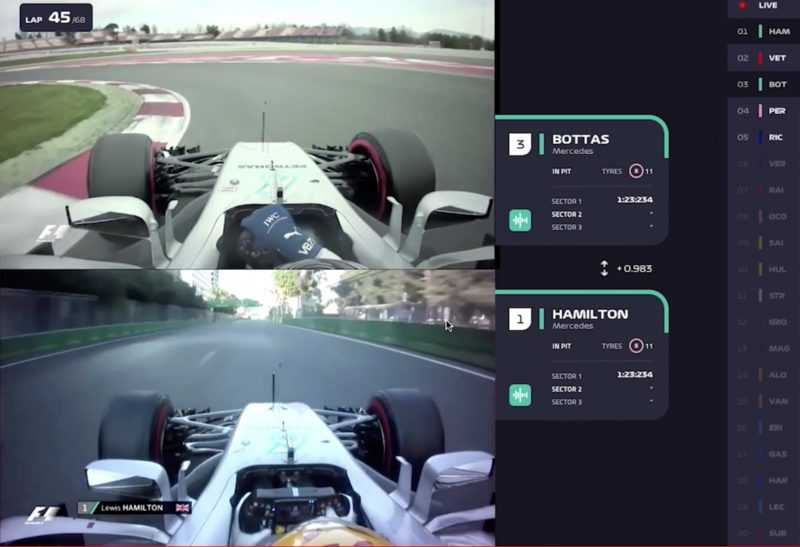 Due to well voiced grievances among F1 fans in the US, it is unlikely F1 TV will ever introduce race interrupting commercials, yet an exciting part of the new OTT service will be its capability of multi-level personalisation. Despite Liberty Media not elaborating on what this means for the service and fans, we envision targeted advertising to be offered directly within each person’s unique space, opening up a new level of targeting for brands. From a brand perspective using audience intelligence to identify their audience’s interests is going to be crucially important when wanting to engage in this space. Technology changes also have a continuing effect on a brand’s marketing decisions. 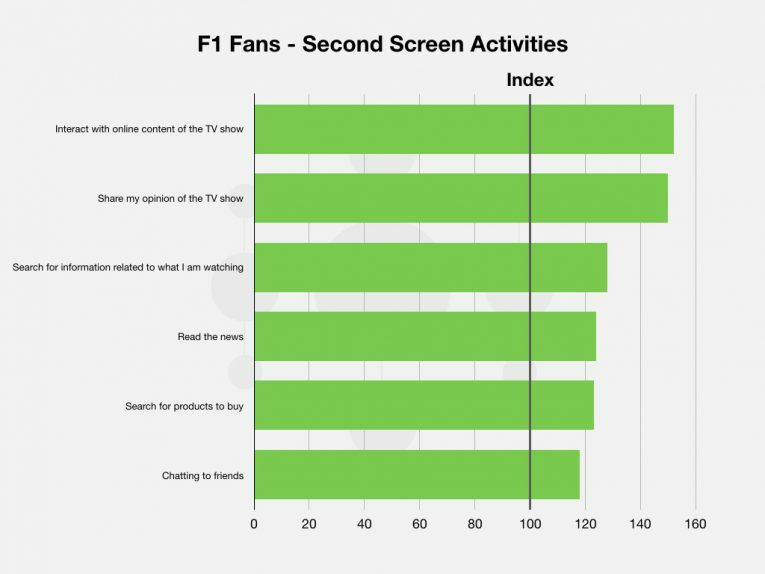 Our research shows that currently 57% of F1 fans are ‘social second-screeners.’ This means the majority of F1 viewers are using additional devices to get online while they are watching TV. What Does This Mean for F1; F1 TV Service, the Fans and Brands? 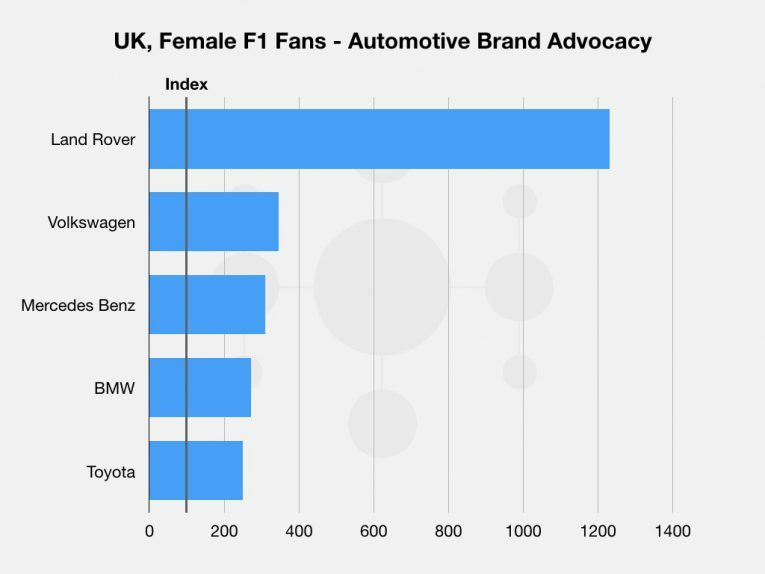 Although the level of audience intelligence shown in the post is merely scratching the service of the in-depth research we carry out, there are still clear narratives which would be of use to both F1 and its commercial partners. The F1 audience is increasingly tuning into sporting events using online services – initially on social media but with a growing number now using paid services to do so. 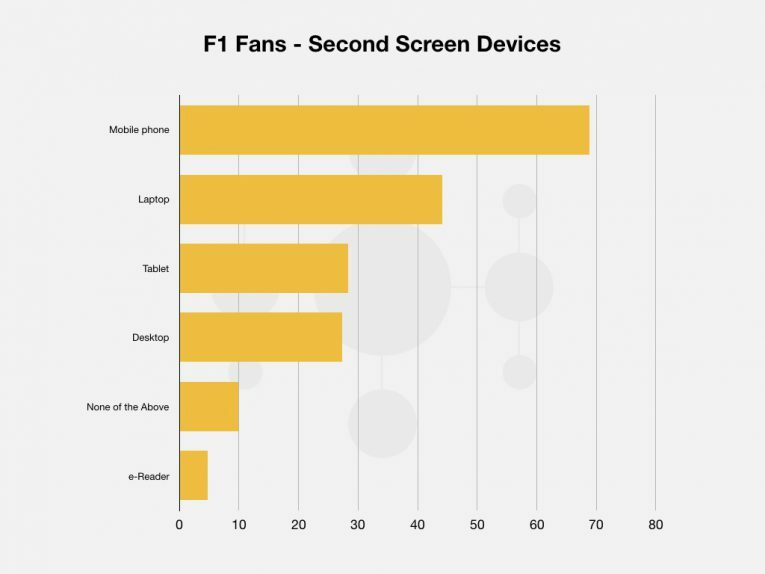 This suggests a dedicated F1 specific OTT service is likely to welcomed by this audience, especially the younger segment. For brands looking to engage with an existing or new audience through Formula 1, the opportunities to target a very specific and digital savvy audience has never been better. As previously mentioned, F1 TV Pro is likely to offer brands unrivaled levels of targeting – further highlighting the need for audience intelligence.